With wonderful golden flowers Grevillea x Honey Gem is one of the best yellow flowering grevilleas. 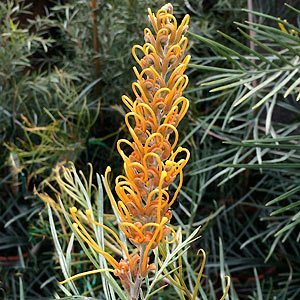 If you like to have honeyeaters and loreketts in the garden, then Honey Gem is the Grevillea for you. Long flowering and with ferny foliage this is a taller growing cultivar that can reach 5m although often less. The golden honey colored flowers appear almost year round. The flowers are very attractive, combined with the way that they attract birds to the garden and the good mid green foliage it is no wonder that Grevillea Honey Gem appears on so many lists of ‘Best Grevilleas’. Although this is a naturally tall growing plant, many gardeners prune it from a young age to keep it more compact. This lowers the flowers to where they can be easily seen as well as making the plant more bushy. Best planted in a sunny position in a well drained soil. In areas of poor drainage, try hilling up the garden bed a little before planting. Water in well after planting and water occasionally through the first summer. Mulch around the plant to maintain a cool root run. Like all Grevilleas, Honey Gem does not like to have its roots disturbed, so avoid digging around the base of the plant. Pruning is best just after flowering. Removal of the spent flower heads acts as a good method of tip pruning. Excellent as a tall hedging plant, as a background plant in the border or used as a feature plant. Very attractive to birds and the flowers last well when cut. Grevillea Honey Gem Summary Information. Foliage – Deep silvery green deeply lobed and textured.